So where did "Big Ben" the bull come from and how did he get his name? Hint: think about our founding fathers. Now think about a kite, a key, and some string. That's right... Benjamin Franklin is our inspiration. And why did BlackBull select the colors black and green? At BackBull, we wanted our name and logo to help convey our business philosophy: keep our clients in the black while they make lots of green. The Bull: In the economy and financial markets, there are times of growth and retraction. A growth market is a "bull market" while a contracting market is a "bear market." At BlackBull, we do our best to keep our company and our clients growing, prosperous, and bullish. In addition, Mark's last name Torr was originally "Torro" (meaning "bull") when his ancestors came over from Italy in the late 1800's. Funny Story: Torro was mistakenly changed to "Torra" during the Census of 1910. Wait, there's more. During the Census of 1930, the "a" in Torra was lost. It somehow rolled away and was never seen again. Our family name officially became "Torr." The Census magicians turned our family "o" into an "a" before making it dissappear completely. Nice work Census. Black: When running a business or a family budget, the goal is to stay in the "black." This means your income surpasses your expenses. This is an important concept. So much so that we made it the first half of our company name. Green: The color green represents financial growth and prosperity. We want this for our company and our clients. 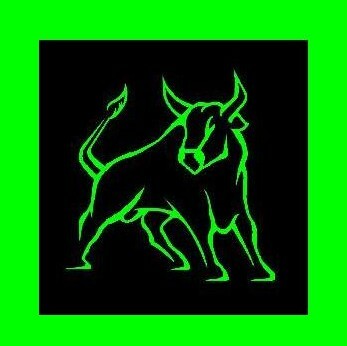 Therefore, we made the green font part of our BlackBull logo. "Big Ben" the Bull: We named our bull Benajmin, after Benjamin Franklin. Franklin was an amazing inventor, businessman, diplomat, visionary, and wise beyond compare. He was the original international rockstar! To honor him, we named our bull after him. Here is some of our original logo artwork. You can see things have evolved.